A Kingston University course module is connecting teaching and research by bringing students in to the heart of industry. Associate Professor Dr Deborah Anderson devised Employer Insights which stimulates new undergraduate research through students interviewing leading figures in the world of marketing. 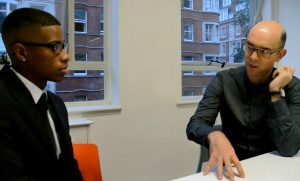 As part of their course, second-year undergraduate marketing students interview senior marketers in their work environment. The interviews are filmed and then shown to the rest of the class to stimulate debate and discussion. Interviewees during the past year have included: Magnus Willis – Founding Partner at award-winning brand strategy consultancy, Sparkler; Kate Howe – Managing Director of Gyro creative agency; Anthony Hopper – Chief Executive of direct marketing agency, Lowe Open and Steve Bell – Chief Executive of top advertising agency Iris. The employer-based teaching approach enables students to link classroom theory with the practical realities of the sector. It provides them with industry skills to add to their armoury when approaching future employers. Dr Anderson – who lectures in marketing and is a National Teaching Fellow of the Higher Education Academy – created this module because she saw that marketing was such a fast-paced discipline that students could no longer rely solely on textbooks. “If we want our teaching to be as fresh and relevant as possible, we need the voice of the industry at the core of our courses,” she explained. Back to all case studies.